At Goldman Sachs, we value diverse perspectives and experiences. The Goldman Sachs Returnship® program was specifically designed for those who left the workforce for two or more years and are ready to restart their careers. This paid, 12-week program offers opportunities in a variety of divisions and the chance to experience the vast network of resources at Goldman Sachs. In the same way that an internship offers a guided period of exploration, a “returnship” provides individuals with an opportunity to sharpen their skills in a work environment that may have changed significantly since their last experience as an employee. It also gives participants the ability to explore a new area of expertise and learn new skills. 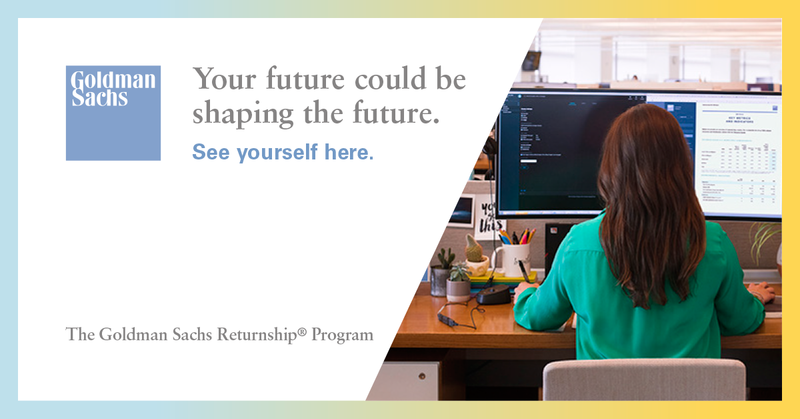 Whether it leads to a full-time career or serves to sharpen the skills necessary to take the next step, the Goldman Sachs Returnship Program is a valuable experience for anyone who’s ready to re-enter the workforce. The first week of the Returnship® includes a two day orientation, business overviews and skills training. The orientation refreshes both technical and soft skills, provides ongoing guidance from senior leadership, includes formal performance reviews and ongoing learning opportunities and involves networking across divisions so returnees can explore opportunities. Divisional managers and stakeholders receive assistance crafting a “hands on” experience for returnees, which offers the returnee a real view into their future responsibilities via the nature and quality of work. Interested to join the Goldman Sachs Returnship Program?